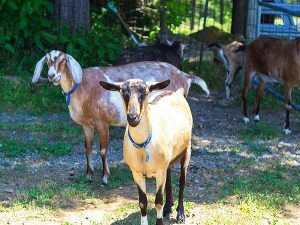 WHAT THEY DO Since 1995, Goat Lady Dairy (GLD) has produced artisanal goat- and cow-milk cheese on a 200-year-old, 40-acre farm in rural Randolph County, NC. 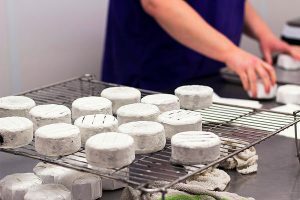 The cheese is produced in small batches using traditional hand-crafted techniques. 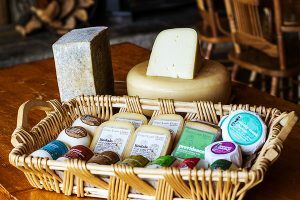 They produce a range of cheeses including their popular spreadable goat milk cheese with creamy flavors like Fig & Honey, Roasted Red Pepper, and an applewood smoked chevre called Smokey Mountain Round. Goat Lady Dairy also makes two aged cheeses, a natural rind goat milk cheese, and a raw cow milk Gouda, and two bloomy rind brie style cheeses. Today, GLD partners with three other farms to produce their nationally award-winning cheese. 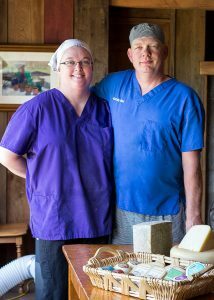 They are one of the oldest, and now one of the largest, artisan cheese dairies in the South. The Dairy is also committed to sustainable farming, farmland preservation, and education. UNDER THE CAPE Steve and his sister, Ginnie, grew up on a corn farm in Illinois before Steve became a therapist, running a counseling center in Minneapolis, and Ginnie became a nurse in Chicago. In 1984, Ginnie moved to a new job in Greensboro, NC excited to get back to her agricultural roots. Looking for just the right land to buy, she drove around the country roads with two pet Nubian goats she had gathered along her way. Soon the neighbors nicknamed her “The Goat Lady.” She moved in, two goats became six and then twelve, and extra milk became cheese. Meanwhile, Steve and his wife, Lee, visited each summer, falling in love with the lifestyle and the goats. As he describes them, “goats are contagious and terminal, meaning once you have them in your life, you can’t get them out.” So, by 1995 they had cashed out their midlife equity and joined Ginnie on the farm. 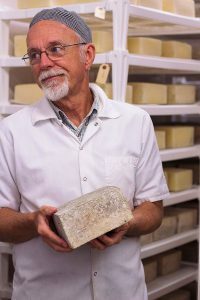 SETTING UP THE LONG GAME For a long time, it was enough to live on the land while learning the skills of goat farming and the craft of cheesemaking. Ginnie kept her nursing job as Steve and Lee gradually grew the herd and cheese sales. Eleven years older than Steve, Ginnie retired from nursing in 2003. Sadly, she contracted ALS in 2006. Because they all lived on the same farm, the family was able to care for her until she passed in 2009. Steve and his wife started thinking about the future, about retirement and what they wanted for the farm. They wanted the work and mission of Goat Lady Dairy to continue, and they wanted to save the jobs they had created. 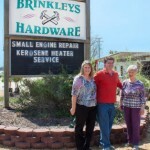 In 2011, Steve was introduced to the SBTDC and started meeting with business counselor Andy. After a thorough analysis, Andy helped them realize that the business was not big enough or profitable enough to sell as it was. He outlined a remedy: change the business model and expand. The first necessary change was moving the goats off the farm to make room for expanded cheese making. Another family farm now handles day-to-day maintenance of the GLD herd, and they buy back the milk. Another goal was to take advantage of bulk purchasing. Having thought of himself as small for so long, Steve did not realize it was an option, but it improved their production costs. Next, they transformed their goat barn into one of the largest and most modern cheese creameries in the South. It quadrupled capacity, making them perfectly poised to fill the niche of the “big little guy” in the market. They could meet the demands of larger stores like Whole Foods and Lowes but still have that local and hand-crafted charm. Since then, they have doubled production and sales, continued adding accounts, and now have eight distributors who sell as far as the West Coast. THEIR SUPER POWERS Their motto from the beginning has been “when you change a person’s relationship to their food, you change them and the world together.” Pioneers in the Local Food Movement, the Tates have always worked to help urban eaters discover where their food comes from and promote environmental stewardship. 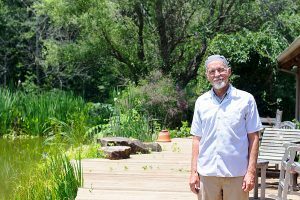 They bring in up to 4,000 visitors a year for events on the farm that allow them to tell their story and share their vision about caring for the land. Steve serves on the board of the Piedmont Land Conservancy (PLC). Working with PLC, the Tates have protected the farm with a Conservation Easement, ensuring it will always be farmland or open land. 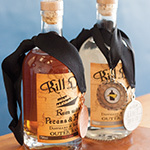 In 2010, they were named Sustainable Farmers of the Year by the Carolina Farm Stewardship Association.